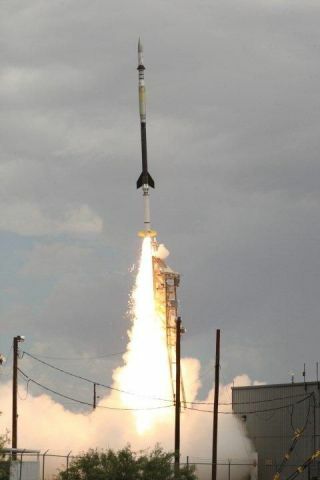 The High resolution Coronal Imager (Hi-C) was launched on a NASA Black Brant IX two-stage rocket from White Sands Missile Range in New Mexico July 11, 2012. The experiment reached a maximum velocity of Mach 7 and max altitude of 264 km. The experiment collected 345 seconds of EUV science images. Image released Jan. 23, 2013. While many NASA space telescopes soar in orbit for years, the agency's diminutive Hi-C telescope tasted space for just 300 seconds, but it was enough time to see through the sun's secretive atmosphere. The Hi-C instrument on the integration table at the Harvard-Smithsonian Center for Astrophysics. Image released Jan. 23, 2013. "300 seconds of data may not seem like a lot to some, but it's actually a fair amount of data, in particular for an active region" of the sun, Jonathan Cirtain, Hi-C mission principal investigator at NASA's Marshall Space Flight Center in Huntsville, Ala., said during a NASA press conference today. The solar telescope snapped a total of 165 photos during its mission, which lasted 10 minutes from launch to its parachute landing. "This mission exemplifies the three pillars of the [sounding rocket] program: world-class science, a breakthrough technology demonstration, and the training of the next generation of space scientists," said Jeff Newmark, a Sounding Rocket Program scientist at NASA Headquarters in Washington, D.C.
Hi-C used a modified Cassegrain telescope with a 9.5-inch-diameter mirror to take close-up images of an active region on the sun, achieving a resolution equivalent to sighting a dime from 10 miles away. While NASA already has telescopes in orbit constantly monitoring the whole surface of the sun, such as the Solar Dynamics Observatory (SDO), the Hi-C mission allowed scientists to focus in on a smaller region than SDO is able to. "SDO has a global view of the sun," Newmark said. "What this research does is act like a microscope and it zooms in on the real fine structure that's never been seen before." The next step, the researchers said, is to design a follow-up instrument to take advantage of the new telescope technology tested out by Hi-C, to observe for a longer period of time on an orbital mission. "Now we've proven it exists, so now we can go study it," said Karel Schrijver, a senior fellow at the Lockheed Martin Advanced Technology Center in Palo Alto, Calif., where the instrument was built.